Toby Moores is a businessman whose stock in trade is ideas. His company generates them by the thousand, filters out those most likely to succeed and then has a stab at commercialising them. The business, called SleepyDog, has had a few major ‘hits’, most notably in the field of mobile telephony security and later with the Buzz quizzes for Sony’s PS2 games consoles. Last week, to coincide with the much-hyped launch of Apple’s iPhone, the company released a blogging tool called LifeCast. So how does the company separate the hits from the misses? Well, it works on ideas in a systematic way grafted on top of something we all have to do which is ‘know our markets’. Actually, in Sleepydog’s case, a lot of market knowledge comes from social media. It blends these three things together and, as an important backdrop, it uses Moores’ concept of a ‘Cool Curve’. This is a kind of stretched comfort zone around your market’s population curve. 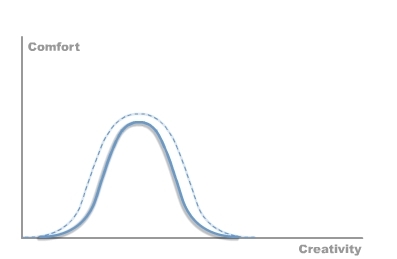 Your prospects probably all fit in a bell curve – leaders, laggers and the mass in the middle. Imagine a dotted line, a halo, a little way outside this bell, this is Moores’ Cool Curve. When you have ideas, they are usually all over the show – some hit the space outside the bell, some hit inside and some land inside the Cool Curve halo. These are the harvestable ones. Inside the bell isn’t cool. And outside the halo is too strange and scary. Of course, the main bell is moving all the time, and you’ll notice that some people manage repeated success by ‘reinventing themselves’ to keep in the halo – Madonna and Picasso are examples of this. Some, such as Van Gogh, were so far out it took years for the halo to reach them. Looking back at my own life and using the Cool Curve theories, it’s abundantly clear why some of my ideas have led to great success while others have led to profound failure. It’s an interesting theory and it holds water. If you’re interested in why things happen, take a peek at Moores’ recent movie around the subject. From a business perspective, it’s perhaps more interesting to hear about idea generation and how social media can help. On the idea generation side, Moores reckons the strike rate is one in 200 ideas. That means if you had one idea every working day for a year, you’re likely to have just one with real prospects. With a team of people working together and bouncing off each other, the density of ideas goes up massively and the likelihood of finding good ones increases. This is the SleepyDog modus operandi. It uses ‘provocation techniques’ such as Edward de Bono‘s Six Thinking Hats to accelerate the process. And the company creates a cast of imaginary prospects to test the ideas against. And this is nowhere more true than in an ideas business like his own.